I work in an old brick building in Greenwich Village with creaky wooden floors that are noticeably slanted, where if you drop a pen it rolls away from you. I kind of love it. Whenever I need to go upstairs, I climb a rickety old staircase that is definitely not up to code. Recently, metal bracing appeared on these stairs. Perhaps we should have felt better about using them now that they had extra bracing, but that was not our reaction. See, before it hadn’t crossed our minds that the stair needed bracing at all, and the new little metal brackets didn’t exactly impart a feeling of strength and stability. 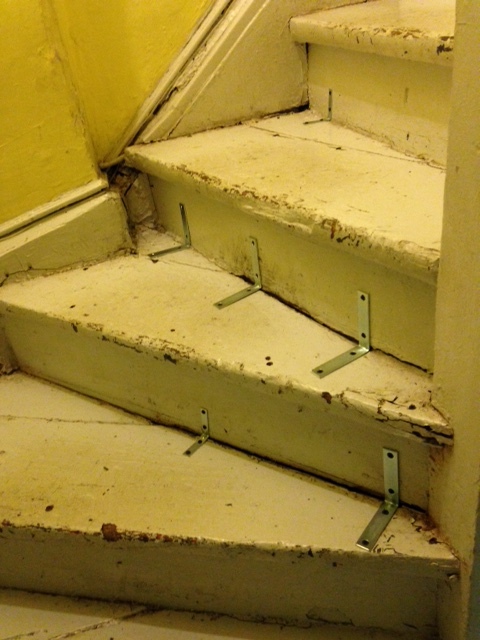 If there was something wrong with the stair, it didn’t look like these little things were going to fix it. I got my hair cut recently, and right when I sat down, the hairdresser said, “Oh, I love your hair color! It has just a hint of red!” It was all I could do to keep from bursting out laughing. A hint of red? 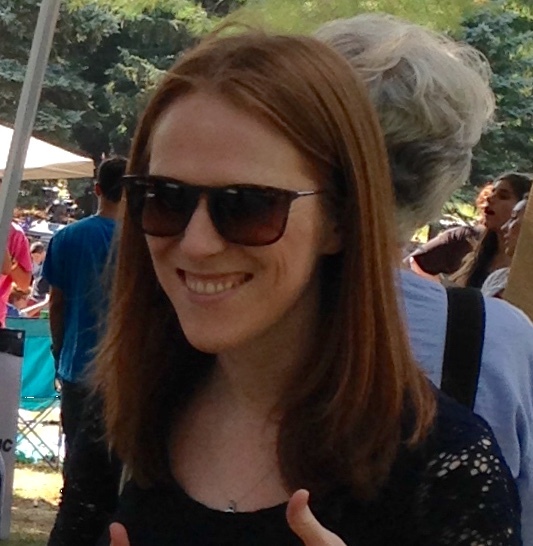 I mean, I know I’m not Ronald McDonald or anything, but I think I’m pretty solidly in the “redhead” camp. This lady kept talking about how my hair was such a pretty shade of blond (?! ), and I just smiled and nodded. But it got me thinking about how hair color is tied to identity in a unique way for redheads, or at least for me. My hair color has always marked me as different, and it has become assumed into my concept of self more than any other physical characteristic. I can’t imagine having any other hair color. Is it like this for people with other hair colors as well? Do you perceive yourself as a blonde or brunette, or as just a person with hair that happens to be light or dark? 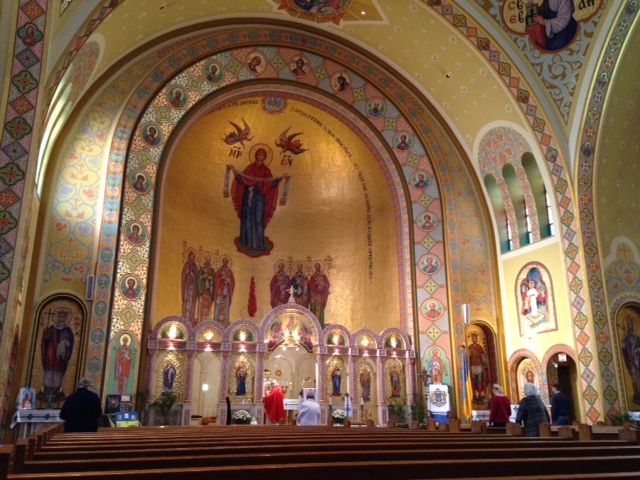 Within the past couple of weeks, I’ve gotten the chance to attend both the Divine Liturgy at a Ukrainian Catholic church as well as the Maronite Liturgy. There’s a Ukrainian Catholic church across the street from where I work—it’s gorgeous inside, but it’s usually closed and gated. Every so often when I walk by I see that the gate is open, and I slip inside. Once I came in during the celebration of the Liturgy, which is all in Ukrainian, and it is so rich and lovely. One of my most-played songs over the past several months is this one—these days, I listen to more Audrey Assad than anything else, and I was delighted to find that she’s done a Springsteen cover. Naturally. As a fellow Jersey girl, I couldn’t love it more (and would it be sacrilegious of me to say that I prefer it to the original?). If you don’t read her blog, you need to read her blog. And her book. Go. Read them now. She was just as wonderful in person as she is online! I’m so glad I got the chance to meet her. In my head right now I hear the voice of one of my best friends telling me, “Stop forcing people to watch your old band videos!” So don’t click if you don’t want to. I won’t be offended if you don’t get overexcited about marching bands like I do. Buuut…if you do happen to enjoy marching bands, look for me at 5:15. And send me your videos because I could watch them forever.